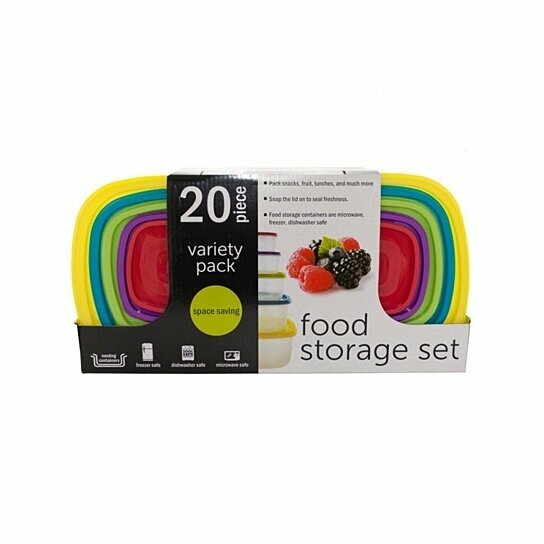 Seal in freshness with this space-saving 20-piece Variety Pack Food Storage Containers Set. Pack snacks, fruit, lunches and much more in these nesting containers. Includes 2 8-cup containers, 2 4-cup containers, 2 2-cup containers, 2 1-1/3-cup containers and 2 1-cup containers. Microwave, freezer and dishwasher safe. Comes packaged in a hanging box. Package measures approximately 14" x 7.25" x 3.5".